Developed from the operational experience of the Magpul DynamicsSM team, the B.A.D. Lever (Battery Assist Device) is designed to considerably improve the speed and efficiency of the AR15/M16 bolt catch. The B.A.D. Lever quickly addresses reloading and malfunction clearance shortcomings of AR15/M16 platforms by extending a paddle to the right side of the weapon, allowing manipulation of the bolt stop from the fire control/ready position with the right-hand trigger finger. Made from milspec-anodized aluminum, the B.A.D. 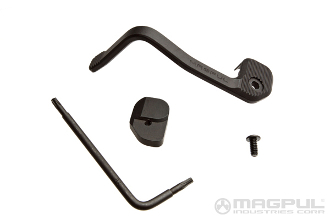 Lever attaches to the standard AR15/M16 bolt release without permanent modification to the weapon. Functional for both left and right-handed shooters, the B.A.D. Lever also allows traditional bolt catch manipulation according to the AR15/M16 manual of arms. All mounting hardware included. * NOT compatible with 7.62x51 (.308 Winchester) firearms as well as most AR15 billet or polymer lower and upper receivers due to their larger and/or non-standard dimensions (including the S&W Magpul Spec Series™ lowers).